Are the Israelis Undermining Al-Aqsa Mosque and other Haram/Temple Mount Structures? The latest actor to weigh in on the need to check the safety of the Israeli Mughrabi Gate project is UNESCO. Rightly so. The Old City of Jerusalem is a World Heritage site and falls under the auspices of the UN body. The Israelis have welcomed the proposed visit to ascertain whether the ongoing archeological project just outside the gate in the western wall of the Haram al-Sharif/Temple Mount endangers the mosque within the compound. 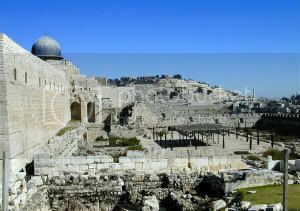 A greater potential danger was surely present in 1968 when Hebrew University archeology professor Benjamin Mazar began to excavate around the south-western corner of the Temple Mount/Haram. Part of the site was much closer to the mosque than the present dig. In fact, Al-Aqsa Mosque was towering above us when I worked there as a student during the summer of 1970. The Herodian masonry blocks supporting the mosque’s southern wall are massive. It is still not clear how such giant ashlars were moved into place with such precision. But they have been there, solidly in place, for the past 2000 years. Suffice it to say, there was no damage to the mosque from the archeological project, which continued under Mazar for 10 years. But there were significant finds from Muslim, Christian and Jewish perspectives. Today, Mazar’s work is evident in a vast archeological park that contains, among other important discoveries, a giant stairway that led into the temple of Jesus’ time, underground cisterns, a first century Herodian street complete with shops, evidence of the Roman destruction of Jerusalem, when stones from the Temple Mount walls were thrown down to the pavement below, and the remains of an Umayyad palace. In 1970, I was digging alongside Palestinians, Israelis and a large number of international students. East Jerusalem was in Israeli hands after the 1967 war and some of us lived in a hotel owned and operated by the Palestinian notable family, the Husaynis. Their New Orient House Hotel eventually closed and became Orient House, the center for the Palestinian political presence in Jerusalem under the late Faysal al-Husayni. It was possible then to work together to discover artifacts of interest to all sides. What has happened in the years since? More ideological division and despair over threats to identity (see Identity, Ideology and the Future of Jerusalem). Is the Mughrabi project not worthy of the support of all for the benefit of all? Leen Ritmeyer, The Mughrabi Gate: What's In a Ramp? As former chief architect of the Temple Mount Excavations, Ritmeyer is able to clearly illustrate the ramp's vulnerability to further damage. Identity and ideology come to the fore again in another element of the Middle East conflict. This time it's over a ramp leading to the Temple Mount or Haram al-Sharif. But why conflict over what seems a necessary project for all concerned? One of the latest flare-ups in the Middle East conflict concerns the Israeli reconstruction of a ramp leading to the Mughrabi Gate, adjacent to the Jewish holy site, the Western Wall. Destabilized in a 2004 winter storm and a small earthquake, the ramp has allowed visitors access to the Wall and the Temple Mount or Haram al-Sharif with its Dome of the Rock shrine and al-Aqsa mosque. Now it is undergoing archeological excavation and reconstruction work. It seems that no one would object to making the area physically safer for all concerned or the discovery of artifacts from the area's Muslim, Christian and Jewish past. But passions are easily inflamed when identity and ideology are involved and here they certainly are. It doesn't help that there's a long history of provocation on all sides when it comes to the Wall and the Haram (see more details in my recent book, Identity, Ideology and the Future of Jerusalem). The gate takes its name from the Mughrabi Quarter that once stood next to the Wall. The gift of the son of Jerusalem's 12th century Kurdish-Muslim conqueror, Salah al-Din, the site was designated a waqf or religious charitable trust, subsequently protected by Moroccan or Mughrabi shaykhs for 600 years. It happened to become the home of the Muslim clerics who performed religious duties at al-Aqsa mosque. As a child, Yasir Arafat lived there for a time with his mother's family following her premature death (see previous post) and heard Friday sermons from his uncle. In 1967, the Israelis demolished the quarter in the aftermath of their capture of the Old City. Defense Minister Moshe Dayan ordered the clearing of the area to accommodate a wide plaza in front of the Wall to allow Jewish worshipers open access to their most sacred site. He would have liked to do more, as he said at the time, by bulldozing a road through the hills, wide enough to allow "every Jew in the world to reach the Western Wall." His actions caused the Jordanian government to complain to the UN about the danger they believed the demolition posed to the Haram and its Muslim holy sites. Today, the situation is very different, but the complaints are similar. Perhaps the offer by the Turkish prime minister to send a technical team to assess the danger, if any, to al-Aqsa, will help. Perhaps the Israeli installation of web cams at the site will also set some minds at ease. Israeli authorities and the notable archeologist, Eilat Mazar, have said there is no risk (see Mazar's response to questions about the situation). All sides stand to gain by the construction work and the potential archeological finds, which may include artifacts from the Umayyad, Byzantine and Herodian periods--representative of Jewish, Christian and Muslim attachment to the area. This webcam (at the site of the Mughrabi Gate excavation) is best viewed using Internet Explorer. The Palestinian Legislative Council said Arab states should "sever diplomatic and economic ties (with Israel) and not establish new ones" in response to the excavation near al-Aqsa mosque. The 40th anniversary of the Six-Day War is coming up in June. It will be a time for reflection on all that happened during those critical days in 1967 when the balance shifted measurably in the Middle East. There’s no question that it was a watershed event. From the perspective of Jerusalem, nothing was more significant in the war than the Israeli capture of the Old City. That story will be told and retold in the months leading up to the anniversary. The familiar black and white images of emotional battle-weary soldiers looking at the Wailing Wall or Western Wall of the Temple enclosure or Haram, will be on display. Two events that occurred in the immediate aftermath of the capture of the city illustrate the parallel and continuing attachment of Israelis and Palestinians to the Old City’s religious heart. They concern David Ben-Gurion and Yasir Arafat. Ben-Gurion visited the Western Wall the day after its capture, accompanied by his protégé, Shimon Peres. He noticed a tile sign in front of the Wall, which read “Al-Burak Road” in English and Arabic but not in Hebrew. It was a reminder of the Prophet Muhammad’s legendary horse. According to the Qur’an, the angel Gabriel initiated Muhammad’s night journey to Jerusalem on the mystical winged horse al-Burak. On arrival, the horse was tethered in the southwest corner of the Haram or Temple enclosure. It’s curious remark for a man who had seen many “great moments” in his long career, one of which was his direct involvement in the founding of the State of Israel. Yet this was the greatest moment as he stood before the captured Western Wall. In his early life, he had stood at the Wall once before. His biographer, Shabtai Teveth, tells of that visit. He says, “Before the end of February  he paid his first visit to Jerusalem, where the sight of the Western Wall brought on such extreme emotional agitation that he remained in the city for a week.” When I asked Teveth in 2002 what this meant, he wrote, “Think of it as a son meeting a father after a very long separation.” In other words, the Wall was a deep-seated aspect of Ben-Gurion’s identity, though he was not outwardly a religious man. The second event immediately following the capture of the city meant something profound to the Palestinian leader, Yasir Arafat. Within twenty-four hours, Palestinian houses adjacent to the Western Wall were torn down to create a vast open plaza for Jewish worshippers. This was accomplished on the orders of the Israeli Minister of Defense Moshe Dayan. Among the demolished houses was a centuries old religious compound belonging to the Abu Sa‘ud family of Arafat’s mother. After her premature death and as young children, Yasir Arafat and his brother lived with these influential Jerusalemite relatives. They afforded him protection and solace in their home adjacent to the primary site of Islamic identity in the city, the Haram. They told and retold stories of their bravery and political fervor in the face of the Zionist threat to the city and particularly to the Western Wall. Not surprisingly, Arafat participated as a child in the 1936 Arab Revolt in the city. One can only imagine that for Yasir Arafat this part of the city was as much a potent personal identity symbol as it was for Ben-Gurion. It may explain in part why his oft-repeated chant was “Jerusalem, Jerusalem, Jerusalem” and why he requested to be buried at the Haram. Though these two leaders are gone, identity and ideology continue to be at the forefront of the Israeli-Palestinian conflict and the future of Jerusalem.